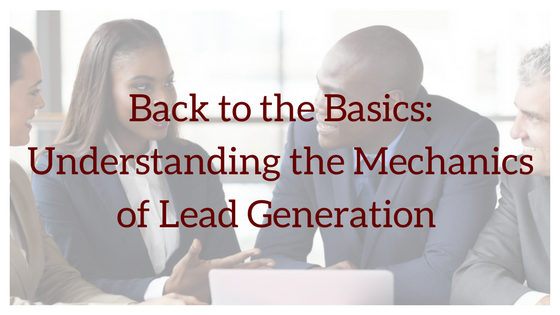 Whether you are new to marketing or decades into your career, understanding lead generation is an ever-changing topic and necessary asset in your marketing playbook. Looking to learn more about your audience? Want to manipulate your existing resources to improve their performance? How about growing your business by improving lead (customer) flow? There are plenty of ways to increase the number of people visiting your site, but unless you convert those visitors into leads, you won’t be able to ultimately get new customers. As a result, your business won’t be able to grow at a healthy rate. Offer– An offer is a piece of content that is perceived high in value. Offers include ebooks, whitepapers, free consultations, coupons and product demonstrations. When an offer is exclusive, scarce, or in high demand, it becomes more desirable. Call to Action (CTA)– A call-to-action is either text, an image or a button that links directly to a landing page so people can find and download your offer. CTAs are the secret sauce to driving people to your offers. If your CTAs aren’t effective at capturing your potential customers’ attention and persuading them to the click, then it makes the offer useless. In a world where every brand is fighting for consumer’s attention, it is critical that prospects choose your offer over your competitors. Landing Page– A landing page, unlike normal website pages, is a specialized page that contains information about one particular offer, and a form to download that offer. The use of landing pages enables marketers to direct website visitors to targeted pages and capture leads at a much higher rate. What’s great about landing pages is that they direct your visitors to one particular offer without the distractions of everything else on your website. Form- A landing page, unlike normal website pages, is a specialized page that contains information about one particular offer, and a form to download that offer. Forms are the key to a landing page. Without them, there is no way to “convert” a visitor into a lead. Forms come in handy when it’s time for people to sign-up, subscribe to your site or download an offer. Generating leads online has the power to transform your marketing. Using great offers, calls-to-action, landing pages and forms while promoting them on multiple platforms can reduce your cost-per-lead while delivering higher quality prospects to your sales team. Understanding the basics is just the beginning. Our e-book contains best practices for every aspect of lead generation to help strengthen your conversion rates. Continue to tweak and test each step of your lead generation process in an effort to improve lead quality and increase your revenue. Consult with a White Rose Specialist today by clicking on the link and signing up for a FREE 30-minute consultation!